Senior executives across the hotel industry united last month during ALIS to end the stigma of addiction with Shatterproof. Shatterproof, a national nonprofit organization dedicated to ending the devastation the disease of addiction causes families, hosted a reception on January 29th to honor Robert Alter, the second recipient of the Shatterproof Hospitality Hero Award. Alter has been an integral part of uniting the leaders of the hospitality world to come together for this cause. The event raised vital funds to support Shatterproof’s efforts to transform the way addiction is treated in America. 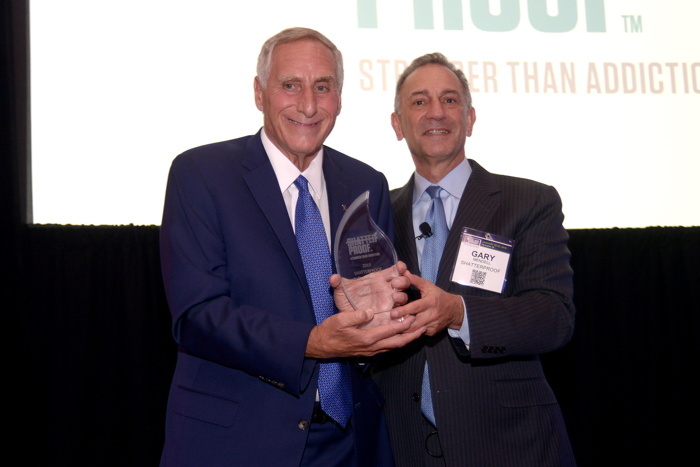 Over 50 hospitality companies joined together to sponsor this event in support of Shatterproof and its founder and CEO, Gary Mendell, a former hotelier (Chairman of HEI Hotels & Resorts), whose son Brian lost his life to addiction in 2011. The event raised more than $635,000, which will go toward advancing Shatterproof’s mission. Studies have shown the hospitality industry is impacted by addiction at two times the rate of other industries, so Shatterproof’s mission is particularly important. Mendell regularly attended the ALIS conference in his 25-year long career in the hospitality industry. After losing his son Brian to addiction, Mendell founded Shatterproof to spare others from the tragedy his family suffered. The inaugural Shatterproof Hospitality Heroes reception was held last year and raised more than $535,000. In 2016 and 2017, Shatterproof hosted the Shatterproof Challenge Rappel alongside ALIS, which raised over $1.6 million. Since 2016, the hospitality industry has raised more than $3 million for Shatterproof at events at ALIS. The 2019 Host Committee for the Shatterproof Hospitality Heroes Reception included: Robert Alter (President, Seaview Investors), Geoff Ballotti (CEO, Wyndham Hotels and Resorts), Mike Barnello (President & CEO, LaSalle Hotel Properties), James Burba (CEO, Burba Hotel Network), Thomas Corcoran (President & CEO, TCOR Hotel Partners), Joel Eisemann (Chief Development Officer, Intercontinental Hotels), Kevin Kearney (VP, Upscale Development, USA, Canada, & The Caribbean, IHG), Daniel Lesser (President & CEO, LW Hospitality Advisors LLC), Gary Mendell (founder & CEO, Shatterproof, Chairman, HEI Hotels & Resorts), William Reynolds (Senior Managing Director, Marcus Hotels & Resorts), Anthony Rutledge (CEO, HEI Hotels & Resorts), Stacy Silver (President, Silver Hospitality Group), Paul Whetsell (CEO, CapStar Hotel Company), Mark Woodworth (Senior Managing Director, CBRE Hotels), and Alfred Young, (COO, LaSalle Hotel Properties). For more information regarding the reception, as well as a complete list of sponsors, please visit https://www.shatterproof.org/alis.